Guest Blog. Hans Lindgren. The Real Solution to Low Back Pain. Motor Control as the Basis for Moving Well! 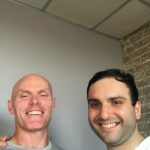 I really enjoyed chatting with Jonathon Rickert from Quantum Yoga. We discussed DNS How Stability is poorly understood and is the essential aspect to understanding Functional Breathing. Posture and Stability in Moving and Yoga Eccentric Control Coactivation Proprioception. Please enjoy, audio goes for 57 minutes.